Over the past two months Refresh has offered two continuing education opportunities to learn more about the body: (1) Lower Back Lecture held by Dr. Vivek Sinha, and (2) Pelvic Floor Workshop held by Dr. Megan Anderson. The overarching theme of both discussions was connection. 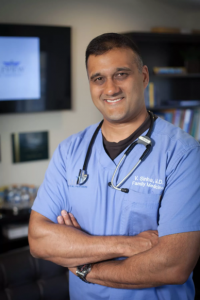 Dr. Vivek and Dr. Anderson both commented on the connections between your body, lifestyle (stress level, hydration, and nutrition), breath, activity level, mental well-being, and overall health. Both Dr. Vivek and Dr. Anderson are big proponents of yoga. They stressed the importance of a healthy lifestyle, deep breathing, core stability, hip mobility, and flexibility. They also highlighted that yoga has the ability to help stretch and release tight muscles, strengthen weak muscles, improve and deepen breathing, and promote future health was highlighted. Lower back pain is extremely common in our society. Many students come to yoga class asking for stretches and exercises to help reduce and/or prevent lower back pain. Dr. Sinha shared that over eighty percent of people will experience back pain, and that most pain starts between 20 and 40 years old. Tight hip flexors, quadriceps, hamstrings, and glutes often contribute to lower back pain. Lack of low back support, a result of weak core muscles, can also cause lower back pain. Other risk factors include smoking, obesity, strenuous jobs, sitting, age, anxiety, and stress. What can you do to reduce lower back pain and/or prevent lower back issues?! 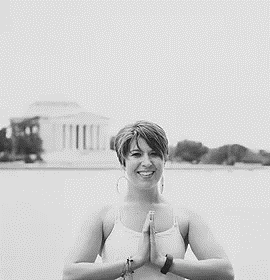 Maintain an active lifestyle and practice yoga! Exercise may work to help acute, sub-acute, and chronic pain. Exercise helps to reduce the neurological changes associated with pain. Improve hip mobility by practicing pelvic tilts and movements that encourage external rotation. Yoga teachers often encourage practitioners to engage their pelvic floors. However, many yogis (you’re not alone) may ask themselves: where is and what is my pelvic floor and how do I engage it?! Dr. Anderson not only defined the pelvic floor but also provided techniques to help find and engage it. The pelvic floor is the muscles that rest at the bottom of the pelvis and consists of deep muscles that help with balance and connect from the back of the sacrum to the front of the body. Pelvic floor dysfunction is not always a result of weak muscles. In fact, Dr. Anderson shared that most pelvic floor dysfunction is caused by overactive muscles. Overactive muscles are on all day and have a hard time releasing. Hip pain, lower back pain, and pain when sitting are all symptoms of overactivity. What can you do to improve pelvic floor function?! Breath is very important for pelvic floor function. Thus, improving the breath by stretching the back and shoulders will have a positive impact on pelvic floor function. Work to expand the breath. Try breathing into the back and firing up the diaphragm to engage the pelvic floor. Use a strap around the chest (bra-line) to feel the chest expanding as you inhale. The hips and pelvic floor are closely tied. Working to stabilize, strengthen and stretch the hips will also help to strengthen the pelvic floor. Practicing yoga is one of the best ways to target these key muscles. Want help finding your pelvic floor? Try practicing pelvic tilts while sitting on the edge of blocks, legs are bent on both sides of the block and knees are on the ground. Roll back and forth from your sacrum to the top of your pelvic floor. You can find more in this article. 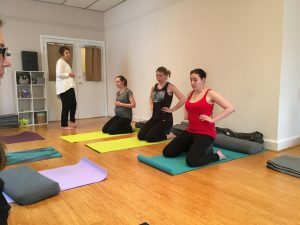 Local Yoga Studio Refresh Yoga Center offers a variety of yoga classes for every level in Old Town Alexandria, Alexandria on Historic King Street.We provide classes to beginners, seniors , and prenatal women. You can also take Vinyasa, Restorative, Teacher Training, and HIIT classes. A convenient location for those in Oxon Hill, Arlington, Belle Haven, National Harbor, Mt. Vernon, and Fort Washington, Maryland.